Although it will take some work on your part, you can get rid of garage door rust if you’re prepared to put a little elbow grease into the job. Not only is rust at the bottom of your metal garage door unattractive, it can also cause some damage if it is left unattended. It can literally eat through the metal and leave holes. In turn, that will threaten the structural integrity of the door and allow dirt and rain to get into your garage. Just because you have rust on your door that doesn’t mean you need to automatically replace it. 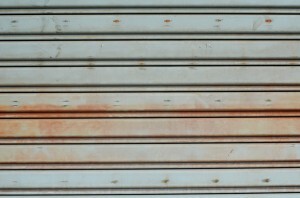 Here are some ways to get rid of garage door rust and stop the process of oxidation that can lead to big problems. First, close the door and then use dishwashing liquid and warm water to clean the bottom panel. The soapy liquid will get rid of dirt and oil. Rinse the door vigorously and then let it completely dry. Next, wipe the rusty area with a cloth dipped in white vinegar. Use a steel wool pad to scrub off the rust. Keep wiping with the vinegar-soaked cloth and keep scrubbing until you don’t see any rust. Sand the spots that were rusted with a palm sander. Sand a couple of inches around the rusted spots to be on the safe side. The sanding will help the primer you’ll be applying in the next step stick to the metal. Use zinc-chromate primer and use a paintbrush to coat the areas at the bottom of the door that you just sanded. Once the primer dries, it will keep more rust from forming. Paint the areas you just primed with a paint that is resistant to rust. If you have any questions or need some help, the experts with Action Garage Door will be here for you. Call 972-215-7906 or contact us online.